Did you know art can help you to decrease stress, increase positive emotions, and clear your mind? And you do not even have to be an amazing artist to benefit from it! 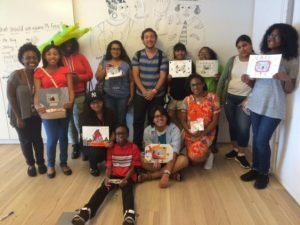 The BeWell Youth Board had the amazing opportunity to head downtown to The Whitney Museum to participate in a teen open studio. They created masterpieces to express their individuality and help to reduce stress. Looking for fun art resources? The Whitney Museum hosts more open studios and other fun events for teens! Check out their website to find out when! The Door: literary arts, visual arts, theater, dance and movement, and music. The Point: music ensemble and production, black and white photography, social circus, Abada Capoeira, visual arts, dance, theater, and culinary arts. DreamYard: theater, poetry, dance, visual arts, photography, video, music and audio production, and fashion design.